The book includes the stories of film historian/critic Leonard Maltin, TCM host Robert Osborne discussing Rock Hudson's secret 1970s film vault, RoboCop producer Jon Davison dropping acid and screening King Kong with Jefferson Airplane at the Fillmore East, and Academy Award-winning film historian Kevin Brownlow recounting his decades-long quest to restore the 1927 Napoleon. Other lesser-known but equally fascinating subjects include one-legged former Broadway dancer Tony Turano, who lives in a Norma Desmond-like world of decaying movie memories, and notorious film pirate Al Beardsley, one of the men responsible for putting O. J. Simpson behind bars. Authors Dennis Bartok and Jeff Joseph examine one of the least-known episodes in modern legal history: the FBI's and Justice Department's campaign to harass, intimidate, and arrest film dealers and collectors in the early 1970s. Many of those persecuted were gay men. Victims included Planet of the Apes star Roddy McDowall, who was arrested in 1974 for film collecting and forced to name names of fellow collectors, including Rock Hudson and Mel Torme. 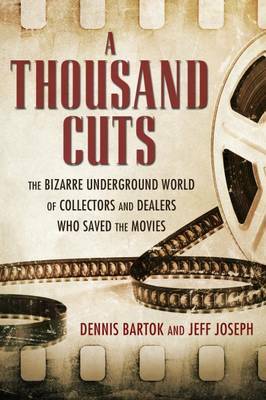 A Thousand Cuts explores the obsessions of the colorful individuals who created their own screening rooms, spent vast sums, negotiated underground networks, and even risked legal jeopardy to pursue their passion for real, physical film.